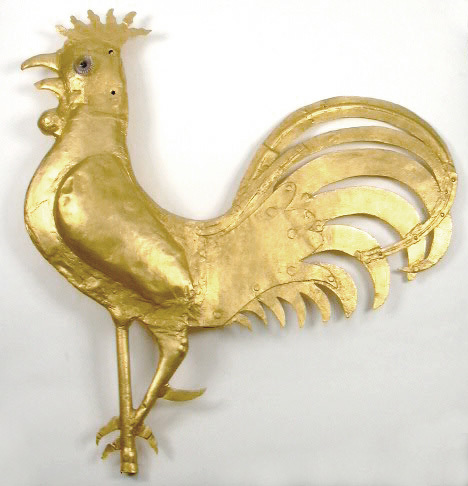 This rooster weathervane, or weathercock, was created by Thomas Drowne in 1771. Originally gilded on both sides, the piece had been partially restored by gilding one side. For its new location at the Peabody Essex Museum, Harvard Art gilded the second side. As with all professional conservation that includes the addition of non-original material, the object was treated in a way that would allow it to be returned to its original form. In this case, that meant using removable materials for gilding.